Summer break may be coming to a close and school lurks just around the corner, but those with traveling on the brain will appreciate the adventures of Edmund Loom, a rambunctious ball of yarn who is out to see the sights that the world has to offer. 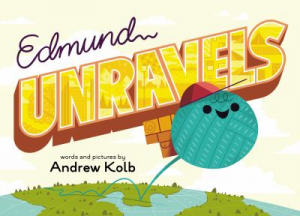 Edmund Unravels, by Andrew Kolb, is the story of a young yarn ball who rolls his way across the globe. With so much to see and do, Edmund is eager to visit new places, but eventually feels a gentle tug towards his home. Andrew Kolb’s beautiful page design and bright, bold colors make Edmund’s journeys simple but incredibly striking. Check out this week’s picture book for a fun story about the adventures of travel alongside the realization that there’s no place like home.